NEW … A great gift idea: my new book of life and home inspirations. You’ve read the weekly Home at Last Postcards now enjoy some of those favourites in this beautifully designed hard-cover book. Click Here. It’s perfect for personal inspiration and as a gift for your favourite people. Many of you know I enjoy exploring the relationship interaction of behaviour and communication. It’s a layer upon layer path honouring journeys of self discovery in this fast changing, consciousness shifting world. I’ve contemplated, researched, spoken and written about communication for many, many years. A background in social anthropology led me originally to consider the synergy connecting the look of a company and the performance of its people. That synergy that energy, those connecting threads of image, communication and management all created strategies for understanding what works and what matters, not only in business but importantly in our personal lives too. I have found many inspirational works, messages and reminders along the way in the odyssey to light, joy and peace. My books and work reflect journeys of personal growth. 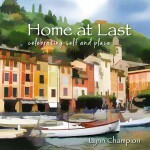 Some of the missives, musings and messages I now offer you from my most recent manuscript, the Home at Last postcards. You can also be part of the weekly emails if you have recently discovered them. Just email me and I will include you on the list. You’ll enjoy each thought provoking Postcard. In Home at Last expect the symbolic. Expect the sometimes quirky. Always know that my words are shaped and formed by discovering, journeying and living a colourful life. Copyright © 2019 Lynn Champion. Buntu by Nilambar.